Hoje me reuni com os outros dois diretores do curta pra fazer os últimos ajustes de planos, decidir ordem de filmagem e conversar um pouco sobre os personagens. A conversa como sempre fluiu muito bem, e conseguimos resolver tudo. O interessante é que quando o professor me disse que eu teria que dirigir o curta com mais duas pessoas eu não fiquei muito feliz, até porque eu não conhecia o Rodrigo e o Wesley muito bem e já tinha pensado no filme inteiro nos meus termos, assim como eles. Mas quando finalmente nos reunimos pra fazer a primeira decoupage (essa não é a de guardanapos, significa escolher os planos do filme) foi tudo muito natural, não teve problema de ego, ninguém tentou afirmar a SUA visão pro filme e tal. Nós três conversamos muito e sempre chegávamos a uma escolha lógica pra cada plano, foi um processo muito legal. Fora que é bom ter alguém pra dividir a responsabilidade. A gente vai filmar na terça e na quinta, e por mais que eu esteja muito ansiosa e louca pra ver como o filme vai ficar montadinho, também to morrendo de medo de tudo dar errado na terça, de ninguém vir, de faltar figurino, de a gente ter esquecido algo, enfim, imprevistos! Eu posso falar pelo departamento de direção que nós nos preparamos o máximo possível. Espero que tudo dê certo nos outros departamentos também. Quanto ao look, apesar de não ter ficado horroroso nem nada, foi um certo fail. Eu estava tentando fazer um posicionamento de sombras um pouco diferente do que eu sempre faço, mas como estava fazendo a maquiagem no ônibus, pra variar, não deu muito certo. Além disso eu não lembrava que a Knickers In A Twist e a Ashes ficavam tão parecidas em mim. Isso também dificultou a idéia um pouco. E hoje só tem olhos porque resolvi fazer a minha sobrancelha e buço na cera e o meu rosto deu chilique! To cheia de bolinhas. Tá ficando difícil viu, qualquer coisa que eu faço pra remover pelos me dá algum tipo de reação adversa. Não sei mais o que fazer! Today I had my last meeting with my fellow co-directors before the shoot. We wanted to meet to review some shots, setup the shot order and talk a little bit about the characters. The meeting went very well, and we managed to get everything we needed done, and faster than the last time. The interesting thing is that when my teacher told me I would have to co-direct with 2 other boys I was not exactly pleased. I didn’t know them very well, and I already had a pretty clear vision of what I wanted for the movie, as did they. But when we finally got to discuss the movie shot by shot for the first time the whole thing just flowed. There were no egos clashing and nobody was imposing anything. We just talked, talked, and talked about the movie till we came up with the shots that made most sense to all three of us. It was an amazing process, and even tough I have created in a group setting before it was pretty different from anything I had experienced. Also, since this is our first time, it’s nice to have someone to share responsibilities with. We will shoot on Tuesday and Thursday, and even though I’m super psyched and cannot wait to see the movie done, I’m also super scared that something will go horribly wrong on Tuesday, that people will not arrive on time, that the costumes might not be ready in time, that we forgot to prepare something important, that the aliens choose to invade earth on that exact day, you know, this kind of thing. I know that me and the other directors did everything we could do to prepare, and that calms me a little, but unfortunately the art director decided to disappear and now everyone is running around trying to cover his part of the work. 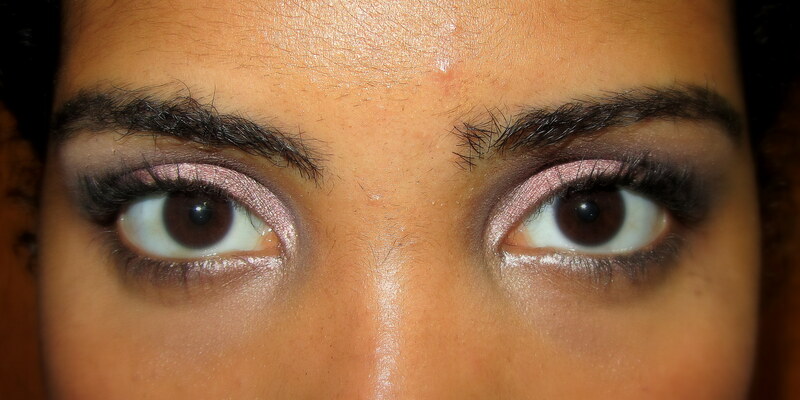 As for the eyes, even though they don’t look horrible or anything, this one was kind of a fail for me. I was trying something different with the shadow placement, but because I was doing my makeup on the bus, again, I kind of messed everything up. Also I didn’t remember that Knickers In A Twist and Ashes looked so similar on me, and that also did not help. No face photo today because I decided to have my brows and upper lip waxed and my face totally freaked out! Yeah, now everything I try to do to remove hair from face causes some weird reaction. I don’t know what to do anymore, seriously!